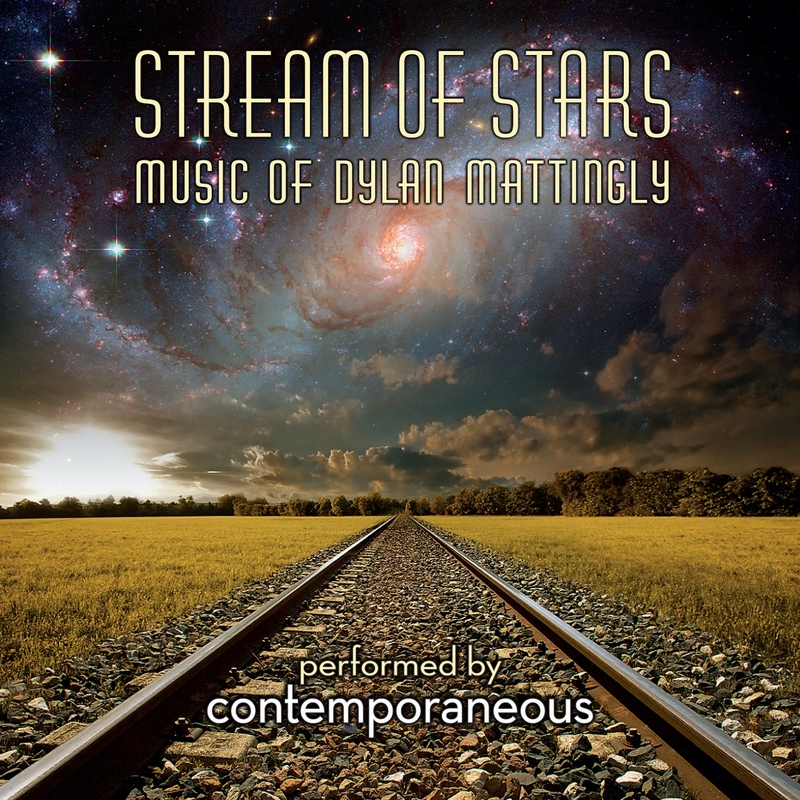 Today, April 24, is the official release date for the first CD from Contemporaneous: Stream of Stars, Music of Dylan Mattingly. To mark the day, a big day for my personal musical history book, I am taking the unusual step of re-posting what I wrote earlier this month about Stream of Stars. For more information about the CD, click here. Cause to Celebrate: As I reported earlier, Dylan Mattingly’s new work, I Was a Stranger, will receive its World Premiere at the Cabrillo Festival of Contemporary Music August 11, 2012. The work was commissioned by composer John Adams and his wife Deborah O'Grady. For more information, click here. Special Bonus: At the end of this post, find out about conductor David Bloom's new sobriquet. Though Atlas appears first in the CD line-up, I’ll write about it last. Sabrina Tabby (violin) and Mayumi Tsuchida (piano) have this music deep in their bones. They give voice to its bluesy pulse, its dreaming and hesitations, with the ease of intimate conversation. A crush of piano notes and a violin’s rocking plaint evoke the lumbering dignity of a barge on dark water. We’re on the barge, looking up, or perhaps we’re on a bridge, watching the barge approach from below. We’re wherever the music takes us, wherever we want to go, sauntering along, hands in our pockets, dancing, drifting, stopping now and then to look as the barge moves past. Or we might be on the barge, staring idly at its moonlit wake, bright pricks of stars above us, until called to resume work’s rhythms of muscle and sweat. The music stops, and the piano slips into silence on quietly lapping chords. The violin soars to a last great height, the piano spills notes into a final chord, and the barge moves off, disappearing in the dark. Leave-taking is palpable from the music’s first wrenching wail. The lighthouse beacon beckons, cutting through fog and night, yet the movement of the music is away, not toward the light. Pierced by plaintive notes, the music, haltingly but inexorably, lets go of a landscape known and loved. With metallic sparks and struggle, the music gains density and momentum, becomes a train speeding down a track. The lighthouse is no longer visible, yet the first violin lays claim to it still: I’m holding on to the place you’ve torn me from, it tells us, no matter where you take me now. The train speeds on. The passenger stares out the window, but there’s nothing left to see. The violins and contrabass go silent, and the cello and viola bring the music to a wistful close. The quintet’s poignant performance, by Alex Fager and Finnegan Shanahan (violins), Josh Henderson (viola), Mattingly (cello), and Zachary Israel (contrabass) with the remarkable David Bloom conducting, comes from deep inside this music and speaks its language with agility and power. Mattingly’s music is the air Contemporaneous breathes. Every note, every phrase, every shift in mood and meaning is fully felt and communicated. The performances on this fine CD bring Mattingly’s visionary magic to vivid life, and the pinnacle of that achievement is in Atlas. As Atlas opens, chords charge the air in exuberant bursts. The music’s engine stutters to life and begins its steep ascent, piercing through clouds and climbing toward the sun. A toy piano scatters celestial phosphorescence; a quarter-tone harp issues spectral sound. A piano settles into a jazzy groove, accompanied by the contrabass. The music reaches altitude and glides in space. Grand and subtle changes limn a journey in all its phases: exuberant, pensive, watchful, and lyrical, in turns. The harp signals a shift from day to night; a piano shivers in the nighttime air. The winds dance along plucked strings; a trumpet heralds dawn. Voices sing low “ahs,” buoying a violin into graceful flight. Mattingly knows when to let silence speak. The piano fades into silence, the music resumes on quiet chords, and a violin emerges in lyrical lament. We realize Earhart has vanished, yet the music refuses to sit in sorrow. The harpsichord strews stars across the air. The music rebuilds momentum, only to have silence overtake it once again. The violin re-enters, and the Elegy begins. The violin and a clarinet lift and fall, a poignant phrase echoed by the oboe and cello in turns. The music, though, will not submit to the dying of the light. In its final section, Starship, it rises to ecstatic heights and catapults a last, great chord into the dazzling air. When I listen to Mattingly’s music, I'm in the company of Harry Partch and Big Bill Broonzy, of Joni Mitchell, Lou Harrison, Bob Dylan, and John Adams—of Miles Davis and Woody Guthrie—of the great composers and musicians who make up America’s musical vernacular But Mattingly doesn’t rest on those traditions, for he, too, is an explorer. He stands on their shoulders and peers out to create a music as vital as it is new. Here are two excerpts from Atlas, the opening and the two final sections (Elegy and Starship), as performed by Contemporaneous at the world premiere on September 24, 2011. Thanks to the lovely writer Jayne, who spotted it on SoundCloud, it's possible to hear the full final movement here. The conductor on the videos has earned a new sobriquet. We now call him David "Koussevitzky" Bloom, for reasons made clear at the end of this post. Thank you, composer Dylan Mattingly, for your visionary music, and to Contemporaneous and conductor David "Koussevitzky" Bloom for taking us on this magnificent voyage into the Stream of Stars. Onward, young Mattingly! He richly deserves a patron/advocate as passionate and articulate as yourself. And now you see you are in the best company as the Adamses follow suit. Hi- As someone new to this type of music, this post was very reassuring. Because it seemed none of the baggage and nomenclature mattered. You were just articulating the way the music made you feel. I loved it. Then when I got to inspect the CD jacket, Mattingly's descriptions were as celestial as some of the vibes I was getting. Wonderful post. Your passion is inspiring and like music extends a welcome hand to all willing to listen. I loved hearing you describe this work Susan. I wish I could hear the music with your ears and share in your passion. Meanwhile, as just me, it is all quite amazing! David: Onward, indeed! Isn’t it wonderful about that commission? I would love to be at that premiere, you can be sure! Britta: I will definitely pass on your good wishes, and how lovely of you to offer them. Scott: You are the most intrepid of explorers! Mattingly’s descriptions are poetic, aren’t they—in fact they remind me a bit of your lyrical passages about Maine . . . and covered bridges . . . and fly-fishing . . . well everything. Rubye Jack: “As just me.” I love that! One day we’ll do some finger-snapping together with Lou Harrison’s gamelan music, how’s that? Jayne: Ah, well, they are truly special, so how can I not applaud loud and often? You know, when I went to Merkin Hall for the Tribeca New Music Festival, there was an older fellow walking around the lobby after their performance who just kept saying, “There’s something happening here,” over and over. I just loved that, and feel the same.